August 19, 2014 – (Blue Island, IL, August 19, 2014) – DKI, North America’s largest disaster restoration contracting organization, today announced that Skyline DKI of Blue Island, IL, mobilized to aide in Detroit flood efforts last week. Last week the Detroit, Michigan area was impacted by a series of storms that lead to significant flooding and water damage. Skyline DKI’s quick mobilization and expertise, in water removal and drying, was welcomed after the torrential rain of nearly 5 inches of rain in a short period last Monday afternoon and evening. In an effort to help with water mitigation, roof tarp and temporary repair services, Skyline DKI sent out three crews to help with the overflow of local restoration companies. Their team effort helped extend the efforts of the local Michigan restorations and come to the aide of homeowners and businesses that much sooner. Skyline DKI is one of the most trusted names in disaster restoration services in the Greater Chicago area. We provide property restoration services to commercial and residential clients, and our many services include fire damage recovery, water damage repair, storm damage repairs, environmental remediation (including mold removal), contents restoration, and reconstruction. For more information, visit www.skylinedki.com. DKI, headquartered in Chicago, is the largest disaster restoration contracting organization in North America. 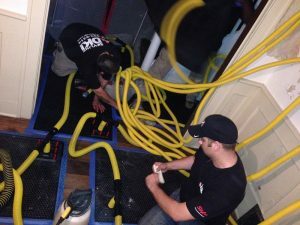 DKI franchise companies provide full service restoration to their customers: emergency response, water damage mitigation, fire and contents cleaning, mold remediation, complete reconstruction and much more, 24 hours a day, 365 days a year. DKI returns damaged property to its pre-loss condition quickly and efficiently, delivering complete satisfaction to our consumer, insurance, and corporate customers. For more information about DKI, visit our website at www.dkiservices.com or contact Jessica Nielsen at (630) 350-3000.